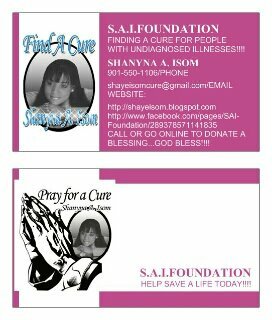 Find A Cure: "MAKE A COMMITMENT TODAY"
HEY WORLD....THE S.A.I. FOUNDATION JUST GOT SOME GREAT NEWS....IT IS NOW ASSOCIATED WITH "BANK OF AMERICA".....WE ARE NOW IN THE PROCESS OF GETTING MONTHLY COMMITTED DONATIONS STARTED IN THE MONTH/YEAR OF "AUGUST 2012"...THE "MINIMUM" AMOUNT IS $20 AND NO SET MAX. AMOUNT...IF YOU ARE INTERESTED IN BECOME A PART OF THIS COMMITMENT...PLEASE CONTACT THE FOUNDATION AT 901-550-1106 ...EITHER LEAVE A TEXT MESSAGE OR VOICE MAIL AND SOMEONE WILL GET BACK WITH YOU AS SOON AS POSSIBLE...IF YOU DO NOT WANT TO BE A PART OF THE MONTHLY COMMITMENT YOU MAY STILL MAKE A DONATION THROUGH MY FOUNDATION PAGE( WHICH IS FOUND ON THE CARD ABOVE) USING "PAYPAL" AND OR AT "BANK OF AMERICA" (WHICH THE BANK INFORMATION IS LISTED BELOW) AS WELL .....I WOULD LIKE TO THANK EVERYONE IN ADVANCE FOR CONTINUING TO HELP SAVE A LIFE.....GOD BLESS....LOVE!!!!!!!! IF YOU WOULD LIKE TO SEND MONEY ORDERS OR CASHIER'S CHECKS PLEASE CONTACT THE FOUNDATION AT 901-550-1106 FOR MORE INFO. 1) You need to include the account zip code for online Bank of America transfers. You can also set up BOA for phone number or e-mail transfers for online BOA banking. 2) The card image has such a low resolution it is near impossible to make out any of the information needed to make a donation. I still don't see any PayPal information. 3) It is rude to ask for charity and then say "$20 minimum." In this economy we are all strapped for cash, and if 250,000 people each give a dollar your bills are paid. I will search a little further for an easy way to donate, but you need to put all of the information in one place: completely and intelligibly. The reality is that people's generosity lasts for 5 mouse clicks. Any longer than that and they get frustrated, forget about the foundation, and you don't receive any money. Yep, could not find your page, so I give up. 2) Explicitly provide your foundation page information, not a low res image. 3) Lastly, bright purple background with blue writing and everything in caps is very aggravating. Studies have also shown that bright colors such as these create anxiety and make people feel nervous. Deeper greens or blues have shown to be soothing. As mean as this sounds, 99% of the population is not going to drive to the bank, or pick up the phone to donate money, and they won't give you $20. They will however click their mouse 5 times, donate a dollar, and then everyone is happy. I wish you the best of luck. Open up a paypal account so people can donate through the internet! It's going to be the best way to help you!